Railway companies today demand modern equipment that is compact, easy to handle and contributes to a reduction in total life cycle cost.In response to stringent demands from railway companies, SKF, as market leader in railway bearings, has developed a sensorised sealed and greased axlebox bearing unit which is already proving its worth on high-speed vehicles. Most railway vehicles designed for high-speed operation are equipped today with an ABS (advanced braking system) wheelset speed control system – also known as WSP (wheel slide protection) – to avoid skidding and locking during braking. 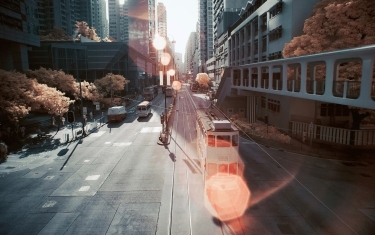 These systems work in a similar way to the familiar ABS system developed for cars. For locomotives and Electrical Multiple Units (EMU) the speed signals are also used to control the wheelset during acceleration, to avoid slipping. An additional function of the electronic equipment is to sense the direction of rotation. Established designs normally have additional speed sensors mounted in the axlebox housing which has to be enlarged in the axial direction. A toothed wheel is usually located at this end of the axle and has to be mounted separately. During installation the gap between the toothed wheel and the measuring equipment mounted on the housing has to be adjusted with great precision. Solutions of this kind tend to require a large number of components. In railway applications, as in many other fields, the trends are to reduce both component content and the number of individual suppliers. 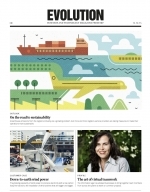 Increasingly, packaged solutions are sought by manufacturers and railway companies. Existing designs also occupy a great deal of space, particularly in the axle area where the railway gauge profile can be limiting. Traditional solutions also increase the unsprung mass which influences the wear of wheel and rails and also passenger comfort during travelling. The sensorised bearing unit for axleboxes, conceived as a new ready-to-mount packaged solution, consists essentially of a lubricated and sealed bearing unit incorporating speed and temperature sensors and a cable with connectors to be mounted on the vehicle body. 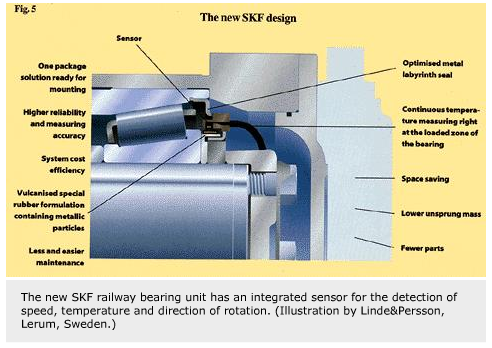 SKF has considerable experience of such sensorised wheel bearings in other applications. Hub units based on this principle have been supplied in high volume for cars and trucks for over ten years. The special requirements of railway applications were taken into consideration when extending the principle to this field. The average mileage of modern railway vehicles – particularly those for high- speed application – is 500,000 km per year. Even locomotives and coaches for normal speeds up to 160 km/h are working up to 350,000 km per year. The service intervals for axlebox bearings can be extended depending on design and usage up to 1,000,000 km or more. The target of railway companies today is to achieve service intervals of axlebox bearings that are the same as the wheelset service interval or a multiple of it. The new design helps railways to reduce the maintenance cost of axlebox bearings because of integrated maintenance routines in the complete vehicle overhaul. Vibrations, shocks, extreme low and high temperatures and handling also had to be taken into consideration during development of the sensorised bearing unit. Due regard has been paid to interchangeability and the interface to existing electrical central units of new railway vehicles and trains. 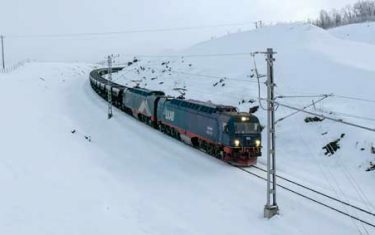 Choice of the optimum sensor arrangement for railway application was based on selective test procedures involving typical simulated load conditions. These were backed by stringent laboratory procedures to assess resistance to vibration and impact, compatibility with lubricants and washing fluids as well as protection against water and dust relating to not only the sensor unit but also other necessary components like cables and connectors. Field testing followed laboratory testing. The Italian railway operator, Ente Ferrovie dello Stato (FS), and FIAT Ferroviaria Savigliano, were very open to this new bearing development and are pushing forward the development of Pendolino high speed tilting trains, for the Italian railway network. At the end of 1990 the field testing programme started. A passenger coach, of the Intercity type, travelling at speeds up to 200 km/h was equipped with a sensorised bearing unit for experimental speed measurement. In the next phase, a further three coaches incorporating a similar concept were put into regular passenger service at the end of 1991. Several checks were made during operation. Based on the results of these field tests, FS and FIAT decided to use the axlebox sensor bearing unit on the four Pendolino ETR 450 coaches for extended trials in regular services on the Rome-Florence route at higher speeds, up to 250 km/h. These sensorised bearing units were now equipped for speed and temperature measurement. 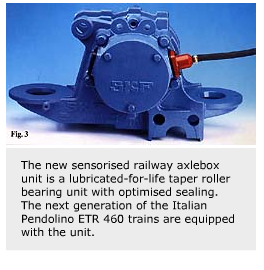 The next generation of the Pendolino, the ETR 460 trains, were all equipped with sensorised bearing units as standard. On the new Italian Pendolino ETR 500 train generation, which reaches speeds of 300 km/h in passenger service, bearing units incorporating speed and temperature measurement are used. The ETR 500 is equipped to operate on different electrical current systems: 1,5 kV and 3kV DC, and 25kV AC. Each 11-car set will accommodate 180 first class passengers in four cars and 483 second class passengers in six cars with maximised comfort. The final carriage in each train set is the service car with a 30 seat restaurant. The sensorised bearing unit is a modified greased taper roller bearing unit (TBU) with optimised metal labyrinth seals carrying the sensor unit. The sensor unit for the detection of speed, temperature and direction of rotation is contained in a lightweight polyamide 6.6 housing, attached to the metal seals of the bearing unit. The sensor unit can be easily mounted and dismounted if necessary during service by two self-locking screws. Metallic inserts in the sensor housing hold the screws. 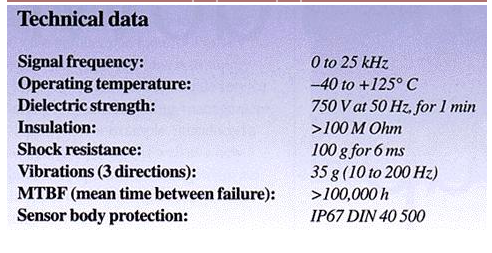 The sensor has to be powered and this is based on the magnetic resistance concept. The output signal has a sine wave form with constant amplitude and a frequency proportional to the rotational axle speed. This basic signal can be treated by a special amplifier stage to obtain the square wave form required by the application. The impulse wheel is one integral part of the sensorised bearing unit. It is mechanically fitted on the journal end during mounting like other axlebox bearing units. The metallic support ring which is part of the sealing system also has an additional vulcanised rubber coating containing magnetic oxide particles. During a special magnetisation operation, the required number of poles are obtained. This specially developed rubber mix is compatible with oils and greases and can withstand extreme temperatures. Cables were selected to suit a high fatigue bending cycle. The connector assembly is composed of a body and special contacts having gold surfaces for housing and bogie frame attachment. The contacts are suitable for acceleration up to 50 g without interruption of the electrical contact. The sensorised bearing units for axleboxes are ready-to-mount units which need no adjustment during installation. 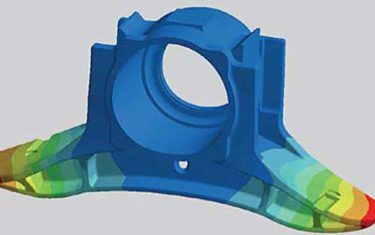 Sensorised axlebox bearings provide a packaged solution which is cost-effective and easy to handle. A versatile solution suitable for several electrical central units and brake systems has been developed to meet different customer specifications. The arrangement is space saving, especially at the axle end where the railway gauge profile can be limiting. The lightweight design causes a minimal increase in unsprung mass. 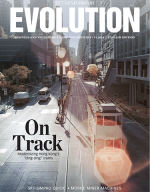 Good reliability helps to increase the safety of railway vehicles. The ready-to-mount sensor bearing units require less and easier maintenance. The flanged sensor can be detached by removing the axlebox end cover without dismounting the bearing unit itself. Feedback from technical specialists of railway companies and manufacturers has been positive, following international presentations of the new unit. The overall impression is that sensorised, sealed and greased bearing units have a central role in modern railway developments.